Will Chef Gorgon Ramsay and Kitchen Nightmares continue to bring solid ratings to the network? Could this be the first of his four FOX shows to be cancelled? Stay tuned to find out. Ramsay helps turn around struggling restaurants on the fifth season Kitchen Nightmares. Episodes typically air on Friday nights on the FOX network. There are 16 episodes. Below are the TV show’s ratings for the 2012-13 season, the best way to tell if Kitchen Nightmares is going to be cancelled or renewed for season six. Final season averages: 1.1 rating in the 18-49 demographic with 3.14 million total viewers. 1.2 in the demo (+9% change) with 3.34 million (+10% change). Season averages: 1.13 in the demo with 3.14 million. 1.1 in the demo (+10% change) with 3.05 million (+1% change). Season averages: 1.13 in the demo with 3.13 million. 1.0 in the demo (-9% change) with 3.02 million (0% change). 1.1 in the demo (-8% change) with 3.03 million (-9% change). Season averages: 1.14 in the demo with 3.14 million. 1.2 in the demo (-8% change) with 3.31 million (0% change). Season averages: 1.14 in the demo with 3.15 million. 1.3 in the demo (+18% change) with 3.30 million (+7% change). 1.1 in the demo (0% change) with 3.08 million (-2% change). Season averages: 1.12 in the demo with 3.12 million. 1.1 in the demo (+10% change) with 3.14 million (+9% change). Season averages: 1.12 in the demo with 3.13 million. 1.0 in the demo (-29% change) with 2.89 million (-23% change). 1.4 in the demo (+27% change) with 3.75 million (+25% change). Season averages: 1.14 in the demo with 3.16 million. 1.1 in the demo (-8% change) with 2.99 million (-2% change). Season averages: 1.10 in the demo with 3.06 million. 1.2 in the demo (0% change) with 3.04 million (-10% change). Season averages: 1.10 in the demo with 3.07 million. 1.2 in the demo (0% change) with 3.38 million (-2% change). Season averages: 1.08 in the demo with 3.08 million. 1.2 in the demo (+20% change) with 3.45 million (+21% change). Season averages: 1.03 in the demo with 2.98 million. 1.0 in the demo (+11% change) with 2.85 million (+8% change). Season averages: 0.95 in the demo with 2.75 million. 0.9 rating in the 18-49 demographic with 2.65 million total viewers. Season averages: 0.90 in the demo with 2.65 million. Compared to last season’s premiere, Kitchen Nightmares was down by 44% in the demo (vs a 1.6 rating) and down by 32% in viewership (vs 3.9 million). Reference point: The fourth season averaged a 1.5 demo rating with 3.58 million total viewers. What do you think? Do you like Kitchen Nightmares TV series? Do you think it should be cancelled or renewed for a sixth season? I have for several years made it a primary show to watch, sometime over and over to see just how much the food industry is hidden from everyday people. I love the show and would really hate to see it cancelled. I have personally learned several key elements as take aways from him. 1. FRESH 2. CLEAN 3. HONEST FEEDBACK. If we provided more of this to everyone in this industry less would fail. I make sure a chef knows when i like his/her food. If i dont i make sure the manager knows and i do not go back. 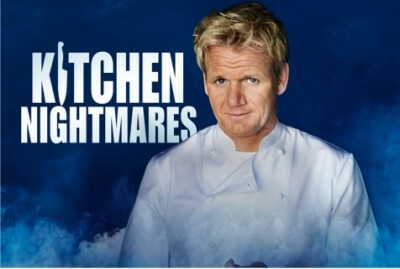 I really like Kitchen Nightmares and will be really sad if it is cancelled. I have always loved watching chef ramsay since the very beginning, from Hell’s Kitchen to Kitchen Nightmares to Masterchef to Hotel Hell. In my opinion, he is DEFINITELY the right man to call for help to fix a failing restaurant. God bless him always. Love the show. I watch all of Gordon Ramsay’s shows. I agree with the other 2 people. I will watch basically all of Gordon. If BBC America let me know better, I would watch his shows that are on there as well. I do not agree with Samara that Kitchen Nightmares is his worst show. That has to go with that awful bed and breakfast show he had on earlier this year. It was so bad I could not stand to watch more then the first episode. Love the Show. I am sure it would do MUCH better on a different night. I always watch anything with Gordon Ramsey! He is truly a remarkable businessman, and a genius with food, as well as being just a good man! That said, “Kitchen Nightmares” is my least favorite of all his shows, and not because of him! The restaurant owners are just too over-the-top, disrespectful (to both him and their staff), and undeserving of his help! My favorite will always be “Hell’s Kitchen”! !